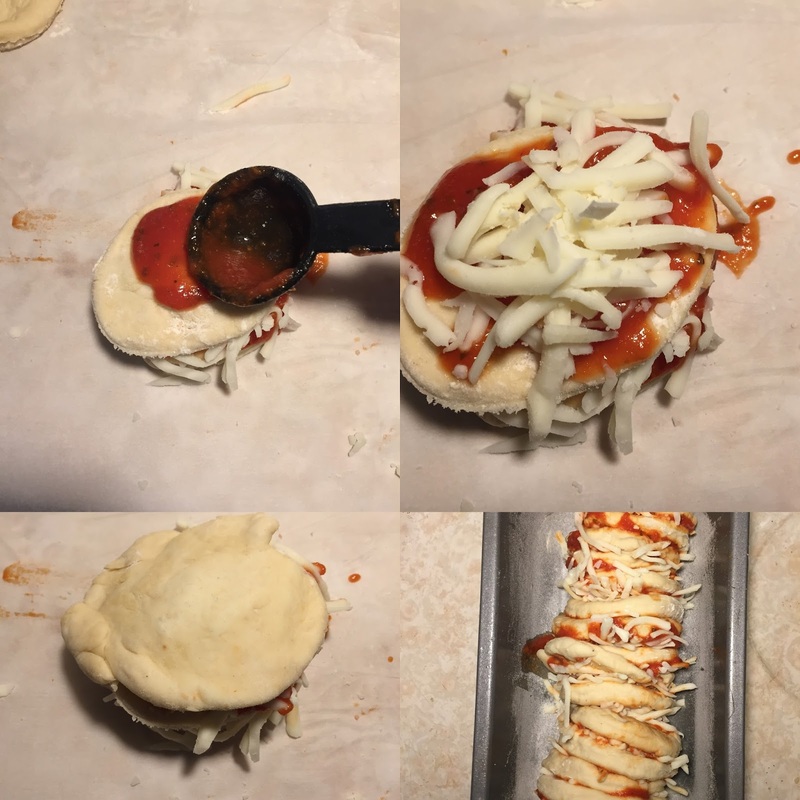 This is my semi-monthly post of pizza recipe. 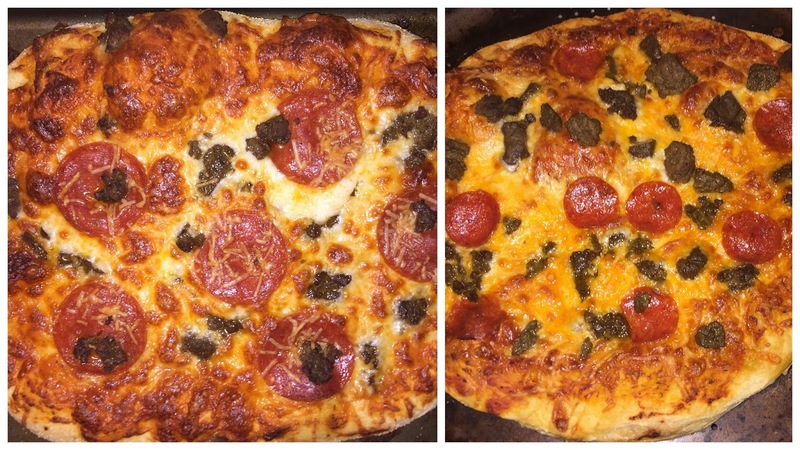 I've posted two recipes for Easy as Pizza Pie Dough and one Whole Wheat Crust and I think its time that I post another pizza one since I have it at least twice or thrice a week. I'm sure I've said in my other post that pizza is just the perfect food and I still standby that. What makes pizza so perfect is the cheesiness, tomato sauce, topping like pepperoni, bacon, sausage or any topping you want plus its easy to make at home, really hard to mess up and relatively cheap to make at home. The only thing that you need is time and patients. This is a simple bread recipe and really taste. Melt butter and let cool slightly. Microwave milk for 1 to 2 minutes, make sure its not scalding hot. Add sugar and dry active yeast to milk, let proof for 10 to 15 minutes. In a large bowl, combine 4 cups flour, sea salt, butter and bloomed yeast. You might need to add a little flour if its too sticky. Lightly knead the dough until smooth. Cover and let it sit in the refrigerator 2 to 3 hours, it won't proof that much. 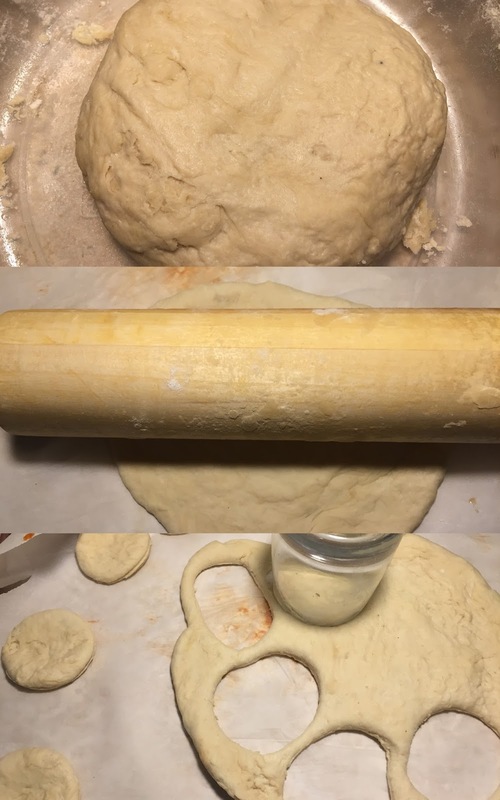 Divide pizza dough in half, lightly message and knead dough with the palm of your hand to stretch it. Dust your counter or a piece of parchment paper with some flour and roll out into a disk 1/4 inch to 1/2 inch.You may need to sprinkle a little more flour if the dough get sticky as you roll. With a round cookie cutter or a small glass, cut out the dough until you get 15 disks. Spray nonstick cooking spray and dust a little flour into the loaf pans. Add maybe 2 teaspoons of pizza sauce to one side of the dough disk then sprinkle on a little cheese. Stack 5 dough disk and place into coated pans. Fill pans then cover, letting them proof for 1 1/2 or until double. Preheat oven to 350 degrees, place loaf pans on cookie sheet. Loosely cover pans with foil, spray a little nonstick spray so the foil won't stick. Bake covered for 35 minutes then uncover baking for another 10 minutes. Let cool on a wired rack in the pan for 10 minutes, take bread out of pans and cool on rack for 15 minutes then enjoy. Store in a ziplock bag, should stay fresh up to a week. Sounds yummy! I am bookmarking this, as I am interested in maybe making this someday. :) I also like that it is vegetarian, even though I'm not one. 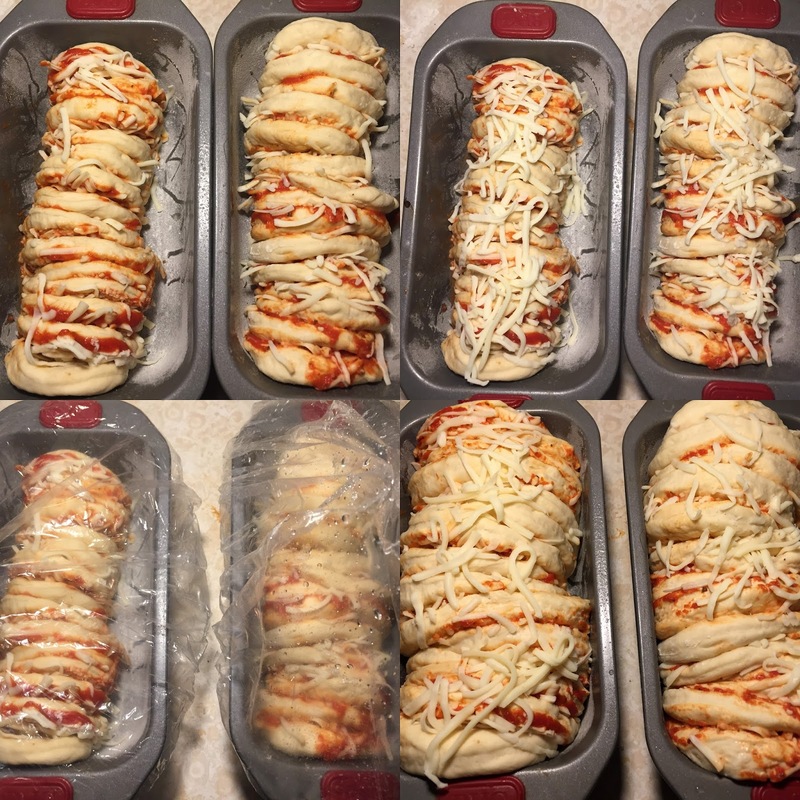 A pizza loaf! Who would have thought? Sounds amazing. I may have to try it. I would love to try doing that! That would be good to share with friends! This looks really good, I make homemade pizza from time to time. I might have to try this recipe. Omg!! This looks amazing!! My husband is a pizza monster! Must try this!! My husband is going to love this!! I could never make this because I could never NOT eat the whole loaf in one sitting,. PS- Im digging the black background and type font on this blog. My husband would eat this daily. Maybe i'd add chicken to one batch. This looks so delicious. I love pizza an cheese, and I want to make this asap. Thanks for sharing. My goodness do these look DELICIOUS!!! definiely going to have to add this to the list of things to make! My kids love pizza ... anything. This is sure to be a favorite! Love the creative way this is made.